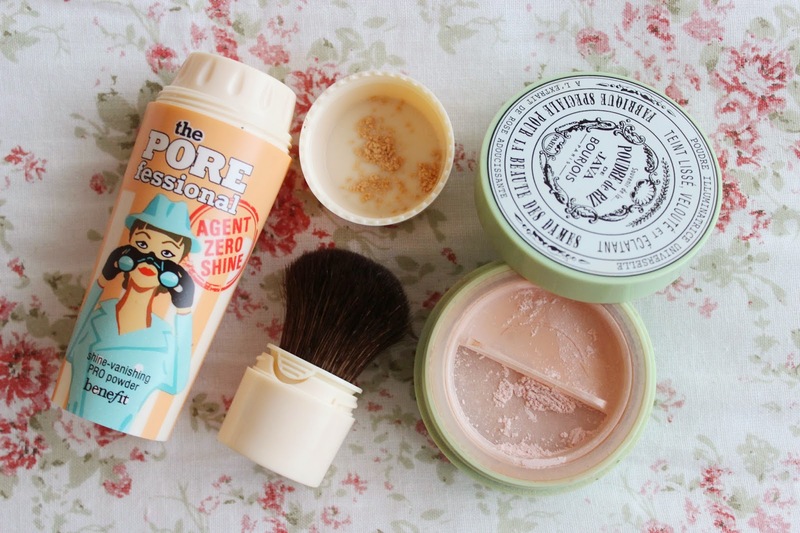 My current loose powders of choice are the Bourjois Java Rice Powder and Benefit POREfessional Agent Zero Shine. I use the Bourjois powder on my t-zone/eye area as part of my morning make up routine. Don't let the pink shimmer scare you- this is a seriously gorgeous powder which not only sets make up and controls oil, but also illuminates/perfects the complexion. It's incredibly lightweight and natural on the skin too making it the perfect powder for non-powder kind of girls that like a dewy base like myself. Sometimes this will keep me looking the right side of glowy all day and other times I have to run to work/get gross on the tube/head straight from desk to dance floor and in these cases a further backup is required and that's when Benefit's new powdery offering steps in. When I first heard about Agent Zero Shine I wasn't actually that convinced as I thought it would be too faffy. However, the all in one powder, brush and pot design makes this a genius little carry around and the actual powder not only banishes shine without looking cakey or too matte, but also resurfaces the skin slightly- dusting away pores and skin paddies in seconds. Bring on the sunshine. Are you lovin' loose powder life? Agent zero shine sounds awesome! Iove that it still offers some illumination!! Loose powders are my favorite, id never use compact. I don't think I've ever used a loose powder! I have some catching up to do!